The BLOOD Slayers: The End of Night - When the lord of all vampires, Count Dracula, sets out to destroy humanity with his allies called The B.L.O.O.D. 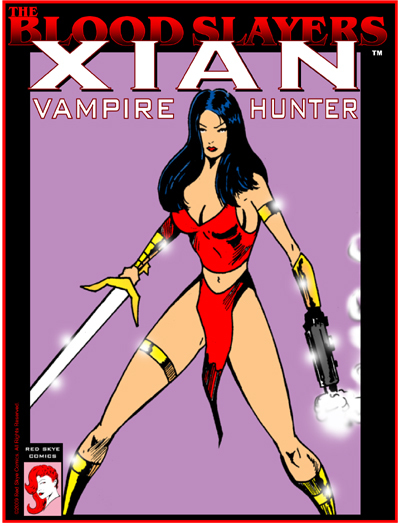 (Blood Lord Order of Dracula), noted expert, Dr. Van Helsing, a descendant of the legendary vampire hunter, Professor Van Helsing, forms a team of heroes to stop him including the vampire hunter, Xian. The BLOOD Slayers: Xian featuring Kim Chi is 20 pages with full color cover and b/w interior art. About Kim Chi: I am a funsize feisty little exotic Asian firecracker located in the DC Metro. At 5'4'', 125 lbs. do not underestimate me as I absolutely love dominating weak men. I am a fetish model and a session girl who travels to the NJ/NY area quite frequently. I am as genuine as blunt as it gets in this industry so if you're looking for a fun fight to remember, I am your chick. Help Support the Kim Chi Page - You Can Donate Any Amount! ©2004-2020 Red Skye Media. All Rights Reserved.